Summer is about road trips, hikes in cool forests, ice cream cones, toes in the sand, jangly pop songs and iced tea. All things are high up on my summer list. Even though we’re not planning one large go-all-out vacation this summer, I’m looking ahead to camping, short getaways and just puttering around my balcony garden. As far as balconies go, we’ve got a decent amount of space outside and I’m starting to get the hang of growing things with a north and east facing light. The euphorbia we’ve got is going nuts in a good way and it looks like the pieris japonica, honeysuckle and the clematis with the shiny, showy leaves are all growing well. My fingers are crossed and hope to grow more green & colourful things. A recently scored lovely vintage planter from Craigslist is just waiting for some colour and herbs! If you’ve got any good container garden tips for North facing light (or filtered light as the case may be) or good gardening book suggestions, please leave me a note in the comments. I want to get a handle on this gardening business before the summer passes me by! My green thumb is excited for summer but the rest of me is glad to have a pitcher of iced tea in the fridge. I’m not sure where I got the idea to pair earl grey tea with hibiscus but it’s a winning combo. Floral and tart with a hint of natural sweetness. Just look at that colour red! It’s stunning and makes a pretty looking and refreshing summer quencher. What’s even better is that you just drop the tea bags into cold water – no need to turn on the stove or wait for boiling hot water to cool down. Just steep in the fridge – easy! Make sure to pour it into your most inappropriate bad joke glass. If it’s bowling-themed, all the better! I love that I don’t need to add any sweetener to this drink, it’s perfect on its own. 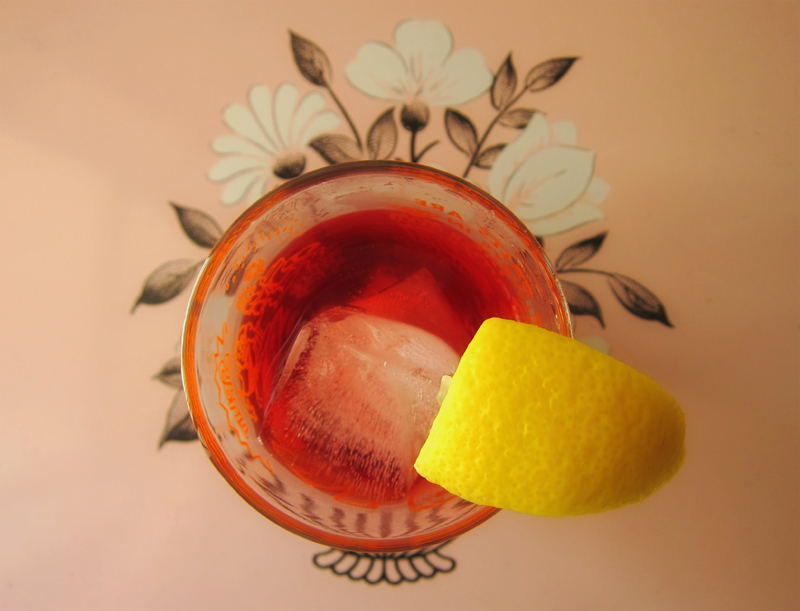 But if you like, go ahead and add some agave syrup into your glass. If you really want to bump up the good times adult-party-style and why wouldn’t you? 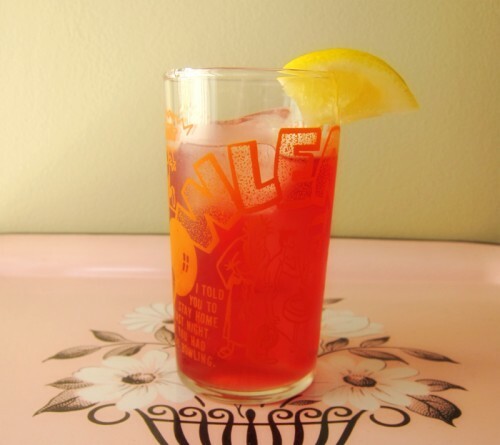 Mix this iced tea blend with some lemonade and rum for a delicious take on an Arnold Palmer. And since I’m already soliciting for advice, I might as well ask for some cabin cooking advice! Next week will be our 8th wedding anniversary and we’re planning a short trip out to Tofino & Ucuelet on the west coast of Vancouver Island. There will be tidal pools to explore along with beach walks and forest hikes. I’ve never been before so I’m super excited! We’ve rented a tiny cabin and plan on doing a lot of cooking while we’re there. Thing is, since I have no idea how the kitchen is stocked, I’m at a bit of a loss about what menus to plan. Luckily, Tara over at Tea & Cookies makes a great start with her post entitled “What do Bring with You for Vacation Cooking” and a similar post was on the kitchn yesterday. Any seasoned cabin-ers out there with tips? Should I pre-prep or pre-make most of our meals in our home kitchen and then transport them via cooler? What if I have a hankering for sour cocktails and I can’t find a reamer for my lemons? What parts of your kitchen do you bring along with you? HALP!! And thanks in advance!! Hibiscus tea makes a great iced tea and not only because of its brilliant red colour. Earl Grey pairs nicely here, adding its own floral & citrus overtones. This tea has a natural sweet/tart flavour, so you might want to try this without any added sweetener at first. If you do want to add something, agave syrup is a good choice since it dissolves quickly in cold water. In a large glass pitcher, add in the tea bags and cover with cold water. Place pitcher in the fridge overnight. You can add agave syrup directly to the pitcher or individual glass and give it a good stir, if you like a sweet tea – I leave it out. Garnish glasses with lemon or lime slices when serving. This sounds like such a refreshing drink! Perfect for these hot days we’ve been having! I love Tofino and Ucluelet! I live in Victoria, so I usually go once a year. Don’t worry about the kitchen. Most of these cabins (though I’ve never been to your particular one) are stocked with most basics. Pots, pans, cutting boards, knives, peelers and bottle openers to dishes, glasses, wine glasses and cutlery. I would say that if you really love your knives, I’d bring your own. The ones in cabins are usually dull. Not all places will have a kettle for tea, but that just means I would boil water in a pot. My best advice would to bring some oil with you if you like to cook with that – rather than buying a large bottle when you get there (I’m pretty frugal). Otherwise, if you forget something or need something (or cook with butter instead), Ucluelet is really small, but still big enough to have a pretty big grocery store called the Co-Op. It’s on the main street, so you can’t miss it. http://www.uclueletcoop.com/ Everything you need will be there. Have fun!!! Dress in layers, it could get windy/cooler at night. We spent my 30th birthday in Ucluelet! SO PRETTY. You’re going to love it. Groceries are pretty expensive out there, so I’d definitely bring a cooler of supplies. We made some fancy food, seeing as it was birthday week–sweet potato gnocchi in cream sauce and a loaf of bread (had to use up the extra flour somehow)–and some simple things like apples and salads and peanut butter sandwiches (had to use up the bread). Expect terrible knives in the kitchen! Other than that, it was pretty easy to cook in our cabin. I just made my first cold-brew coffee of the year the other day, and iced green tea has been happening for several weeks. I’m definitely going to have to try out this version–sounds delicious! I also went away to a cabin rental this spring…and didn’t know what to bring. It is hard to judge what people think a fully stocked kitchen really means. I ended up bringing a little too much, but better safe than sorry. If you think you will use the reamer, then bring it (its small anyway). I planned the first meals and brought stuff ready to go. Like I made tomato sauce and meatballs and froze them both. Packed them in the cooler and they were great the first night with some pasta and cheese (pre-grated at home). I also made enough vinaigrette to last the whole weekend, and stuck that in a jar and put that in the cooler. Since bacon and eggs are always a must for breakfast… I cut a dozen eggs in half (in the cooler) and had half a pack of bacon in my freezer that I also took with. I think if you plan the first few meals… you can always get more food in the area, that is more fun anyway. Have fun! Love the glass in the post. 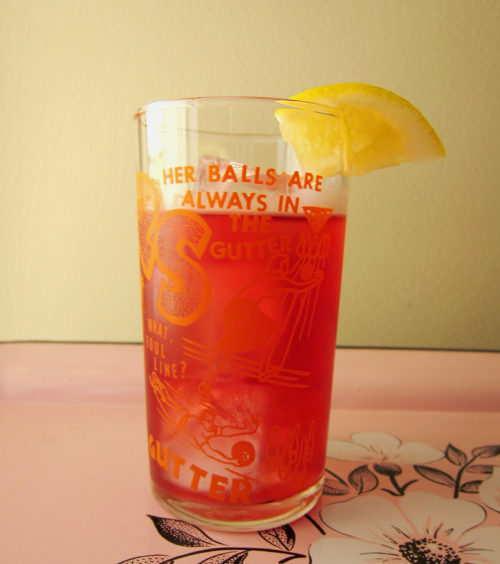 This iced tea looks lovely! As for your garden.. try nasturtiums! I am dreaming of having a balcony some day (or maybe even a yard!?) but I have had some success with nasturtiums outside my windows. They are beautiful and bright and floppy, and edible! I think they like some shade, not full shade.. and they prefer poor soil; you’ll get more blooms that way. Good luck! I can almost always repurpose existing kitchen gear into something useful (a fork makes a fine reamer), and for a short trip, I don’t mind paying a small premium for the convenience of not packing a cooler, and the fun of exploring a new grocery store, or stumbling upon a local market or producer, and letting their wares inspire my cooking. In the meantime, I’m totally trying that tea, at the first hint of sunshine here! Thanks Joanne! The weather suddenly turned cold & rainy, but I know I’ll be drinking these when the sun pokes through again. Mary, thanks for the tips! I’ll definitely bring a sharp knife & a small bottle of olive oil. Eileen, so great to hear you had a good time in Ucluelet and I love how you did a good job of fancy & simple for your meals. I don’t know if I’ll get that fancy, but I’m excited to cook in a different kitchen for a change. Ha, hag, I’ll probably bring too much too. Thanks for sharing your ideas – I’ll probably do the same: mix up some dressing & pre-make a meal or two! Elena, I just planted some nasturtiums (a friend passed along some seeds), but nothing has sprouted yet. And yay, glad to hear that poor soil is good for something!! Thanks. Jen, it’s true, I love being spontaneous on trips, but since it’s such a short holiday I don’t want to spend much of it grocery shopping. Thanks for your tips! I’m a huge fan of iced tea…huge! That’s all I ever order in the summer when I go to Starbucks. 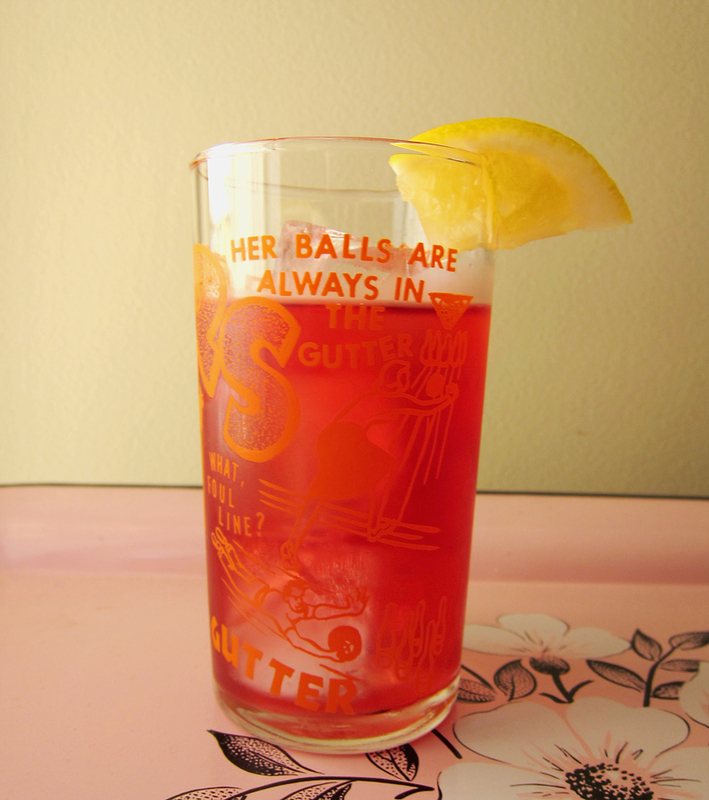 I need to get on that bandwagon as I have yet to make any iced tea so far this summer. Hibiscus tea has a great aroma plus a vivid colour that also makes it pretty to look at in a tall glass. Bijoux, I had no idea starbucks even sold tea (ha, bad joke from a severely addicted coffee fiend). Thanks for your well wishes, our trip was awesome and not at all scary – though we did see 2 bears!!! Yikes! Hope you made a lot of noise to shoo away the bears. That’s what I was told to do when I went hiking in Banff 10 yrs ago. We whistled and jangled our keys because it was kinda scary, Joanne!! Eek.